Mouse anti Human Complement Factor H antibody, clone OX-24 recognizes the human serum complement protein factor H (155 kDa), binding to a different epitope from MRC OX23.  The antibody also recognizes a 43-49 kDa truncated form of factor H present at low level (1-5 μg/ml) in plasma and urine. In an immunoprecipitation system, it recognizes factor H in other primates, but not in cow, sheep, pig, chicken or rabbit sera. Mouse anti Human Complement Factor H antibody, clone OX-24 inhibits the binding of factor H to surface bound C3b, and recognizes Factor H in Western blotting procedures. NS-0 myeloma fused with spleen cells from BALB/c mice. Johnson, S.A. et al. (2010) Impact of compound heterozygous complement factor H mutations on development of atypical hemolytic uremic syndrome-A pedigree revisited. Mol Immunol. 47 (7-8): 1585-91. Hamidov, Z. et al. (2011) Reduced expression of desmocollin 2 is an independent prognostic biomarker for shorter patients survival in pancreatic ductal adenocarcinoma. J Clin Pathol. 64 (11): 990-4.